I like to write about the funny and sometimes-only-funny-after-the-fact stuff that happens to us. It’s super easy when it’s something that actually happened to us – I just add a bit cynicism or obvious truth to the commentary and the post writes itself. However, Scott and I get asked about the logistics of our day quite a bit. How do we decide where to camp? How do we set up the Chief? How do we exercise? What do we cook? How do we deal with internet? That’s not as easy to write because it’s hard to be snarky at the decisions you’re actively making. All stuff I don’t usually include. Naturally, I did the smart thing and assigned it to Scott (that way if it wasn’t funny you wouldn’t hold it against me). He’s been saying he’ll do it for awhile now (*cough procrastinator cough*). I’ve caught him playing on the interwebs too many times to think he’s going to write it during this year. In his defense, he’s usually busy with the company, kids, me, grilling, working out. He’s also intimidated to write more than a few sentences. That’s correct VIPs… he’s got the heart of a lion but you all scare the hell out of him. Too funny. Anyway, I’m going to write about the boring stuff and he’s going to come in and give it a once over to make sure it’s not too far off the mark. I’m going to call these posts “Daily Life – XXXX”. If you find them boring (…none taken), skip them. You won’t miss any of the fun pictures from the great adventuring. Deal? Our days start slow. The kids are our natural alarm clock. One or both of them usually wake up sometime between 7 and 8. Today they got up with the sun. Both of them. That’s hurtful not helpful. I sleep like the dead so I could keep going a few extra hours (and often put in a solid effort trying to block them out). Depending on how we’ve slept (the arrangements change almost nightly) we either have kids crawling all over us or Evie is yelling for us to help her get down out of her bed. Ev almost always sleeps in the bed above the driver’s seat. She sleeps up there through the night 90% of the time. The other 10%, monsters force her to come get in bed with Mom and Dad. Jack is usually put to bed on the couch. If he wakes up in the night (true most nights), Scott brings him to me and then takes the couch himself. He prefers the couch because his back doesn’t hurt in the morning. If we manage to get an entire night in the big bed… that has happened maybe 2 or 3 times in the 3 months we’ve been on the road. Every night before bed I lay out of the coffee and hot chocolate. The kids got in the habit of hot cocoa in Colombia and it’s now become a big deal. I don’t mind it though because the Chief is usually chilly in the morning – especially the floor. The warm drinks helps everyone get up and get going. We make single serving coffee using a filter we got in Hawaii. I heat the water in a tea pot on the stove. Originally we used the microwave for the water. Then we learned how much juice the microwave requires from the batteries (A LOT) and the microwave crapped the bed. Easy decision to use the tea pot. Ideally, if we’re not planning to move that day, Scott gets a few hours to work in the morning and I take the kids. Where I take them is entirely up to me. I use apps to find grocery stores, run errands, get directions to nearby parks, locate the town library. “Find X Near Me” is my go-to Google search. TripAdvisor has provided some unique ideas. We also bought access to RoadsideAmerica.com which is how I find some of the really weird stuff. I also obsessively collect pamphlets, you know how I am about visitor centers and I talk to locals. I get a kick out of adventure planning so finding something to do is a fun challenge. It’s not fun or challenging when Scott stops on the side of the road and my only option is to explore a falling apart rodeo corral for well over an hour (but that only happened once). Breakfast rotates between scrambled eggs, pancakes, oatmeal and cereal. We also have yogurt and fresh fruit on hand. I do the dishes (by hand, twice a day) and Evie is responsible for drying them. She does it well when she wants to… which is about 50% of the time. It’s her new chore. Sometimes it’s fun, sometimes… it’s a chore. After I get everyone dressed and pack a day bag, we head out in the Grey Man or on the bicycle. Jack normally naps around 11-ish but there is no tight schedule with us. The kids are not run like a tight ship by any stretch of the imagination. If I can get Jack back to the Chief, I do. He doesn’t sleep as well in a car seat or in the backpack so I like to get him to a bed if possible. Sometimes Evie sleeps, most often she does not. We normally wait for Jack to wake up before having lunch. The day changes substantially if we’re going to move. Almost all of the campgrounds we’ve been in have a checkout time of 11 am. For some reason, that’s actually hard to hit. Inevitably we’re scrambling to dump and be driving out the gate by 11. Maybe it’s because we really make ourselves at home so there are toys and exercise equipment all over the place outside. Maybe it’s because I insist on cleaning the Chief before we hit the road (who wants to arrive some place only to have to clean for an hour?!). When we’re moving we’re pretty diligent about not driving for more than 2 or 3 hours if we don’t absolutely have to be somewhere. It’s so much nicer to get to a spot in the early afternoon and get ourselves set-up before dinner. For whatever reason, the mornings go by quickly. Scott and I both check mail. Evie always asks for the ipad to play StarFall. Sometimes she gets it, sometimes she doesn’t. Jack refuses to wear socks or slippers so his feet are always cold and he’s into everyone else’s business. That’s about it. It’s an easy life, no doubt. By the way, the cookie at the top was made on the grill. 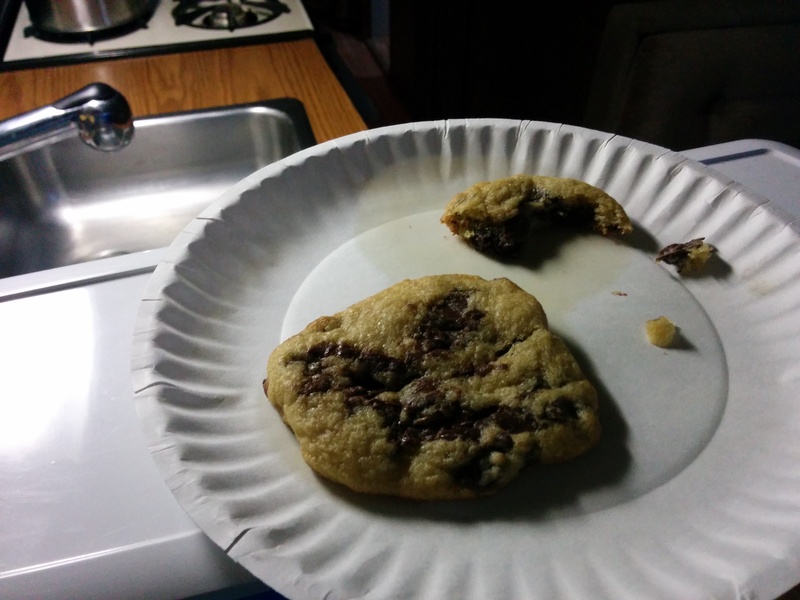 We finally figured out how to have fresh cookies again…. yes, sometimes even for breakfast.